Distributors and dealers are both participants in the traditional supply chain. The supply chain usually consists of the manufacturer, distributor, dealer, and customer. Products move through the supply chain in that specific order. Even though distributors and dealers are not the same, both act as a middleman within the distribution process. There are some shared characteristics between the distributors and dealers but also several key differences. Both parties can use the logos of the product manufacturers but may not include the manufacturer’s name in their own; both parties purchase the goods to sell; and both parties may enjoy certain incentives; however, there are key differences between the markets for which each party caters, and which manufacturer’s products the distributor or dealer is allowed to sell. This article describes the work done by the distributor and the dealer. It also considers the differences between distributors and dealers. A distributor purchases product lines that do not compete with each other and sells these products to resellers (dealers). The products are usually purchased from only one, or a few, producers. The distributor will be the only one to sell a certain brand of products in a specific geographical area, thereby making competition slightly less. The distributor purchases the products at a wholesale price from certain manufacturers and then stores the products in its warehouse until products are sold at cost price and shipped to resellers. The distributor will also provide several other services to the resellers, for example, product information, after-sales service and technical support. 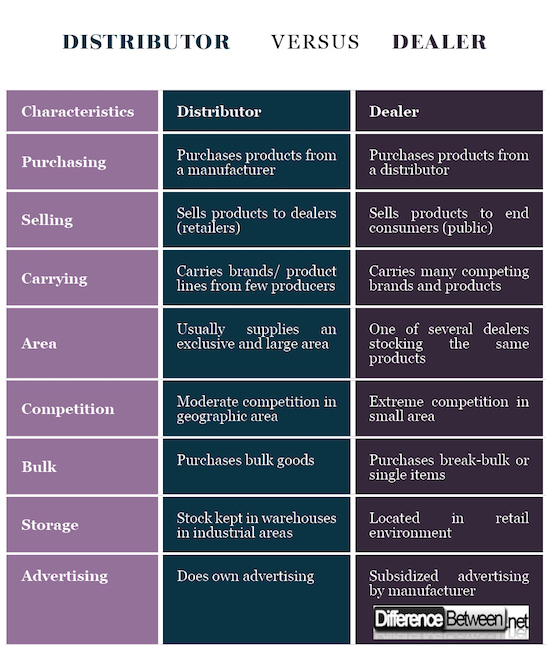 A dealer purchases goods from a distributor, or several distributors, to sell in the retail environment. The products are purchased at a cost price and then sold to the public after adding a mark-up to the original price. A dealer stocks a wide range of products, often from competing distributors. Several dealers may exist in the same geographic area, creating extreme competition among the dealers. Dealers need to maintain a high level of customer service in order to retain customers. Poor customer service, and products that are out of stock, may result in customers making purchases at a different dealer. Distributors are the link between the manufacturer and dealer; the dealer links the distributor with the customer. Distributors stock product lines from one, or a few, manufacturers whose products do not compete with each other; dealers stock a large assortment of competing products often from several distributors. Distributors supply a large geographical territory; dealers supply to a more localized territory and competition may be located nearby. Distributors have a developed dealer market to which they sell, dealers sell to an established end consumer market. 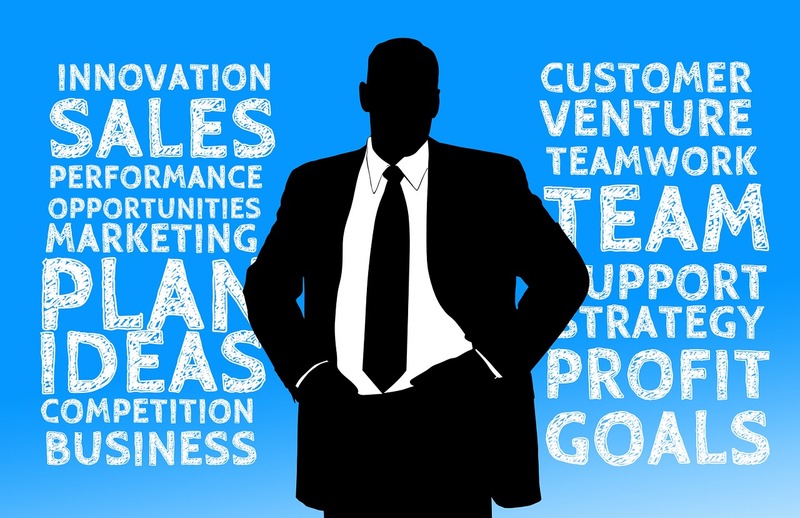 Distributors experience moderate competition but dealers operate in extreme competitive conditions. Distributors are offered purchases incentives from manufacturers, whereas dealers receive incentives from the distributors. For example, incentives could be discounts and subsidized advertising. Distributors purchase items in bulk from manufacturers, whereas dealers can purchase single units or smaller bulk amounts from the distributor. Distributors purchase products to allow the manufacturer to produce more as manufacturing capital is freed up; dealers often purchase products on credit from distributors and later pay the owed amounts. Distributors keep stock in large warehouses in industrial areas and ship products to dealers; dealers are usually located in retail environments that are easily accessible to consumers with only some offering delivery options. Distributors have to do own advertising with the help of manufacturers; whereas dealers benefit from national (or international) advertising being done by manufacturers and distributors of the brands. The distributor and dealer each have a distinct role in the supply chain with clear differences existing between them. The largest difference is the markets served and the manner in which products are handled. Distributors serve dealers, purchase products in bulk and store products in space-saving ways; dealers serve the public, purchase items in smaller amounts, and are located in retail spaces that are easily accessible. Distributors also aid manufacturers in freeing up capital to produce more products. Giving credit to dealers allows the distributor to have product lines in-stores and available for sale. 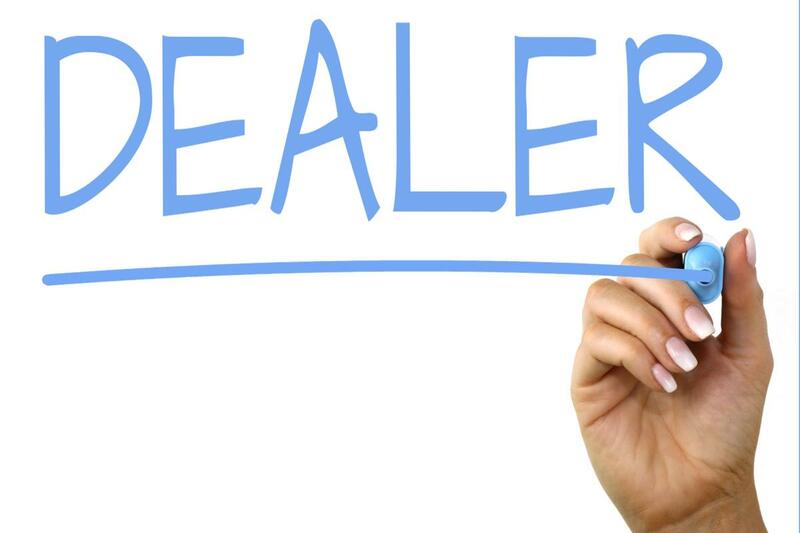 Customer loyalty is something that dealers fight for as competition is often fierce; distributors do not worry too much about competition as the reach of the dealer spans a larger geographic area. Distributors and dealers are vital parts of the supply chain process. The public, or end consumer, constantly requires products to be available for purchase to meet some need or desire. The consumer purchases these products from the dealer in a retail environment. The dealer has products available as it procures different items from distributors. Distributors purchase products from manufacturers. In this way, the importance of both dealer and distributor becomes evident: one cannot exist without the other. de. "Difference Between Distributor and Dealer." DifferenceBetween.net. April 12, 2018 < http://www.differencebetween.net/business/difference-between-distributor-and-dealer/ >.